In his 1976 book The Secret Happiness of Marilyn Monroe, as well as in various interviews and articles, Jim Dougherty blames the breakup of his marriage on his Merchant Marine duties. He paints an idyllic portrait of his life with Norma Jeane in the period before he was shipped overseas. 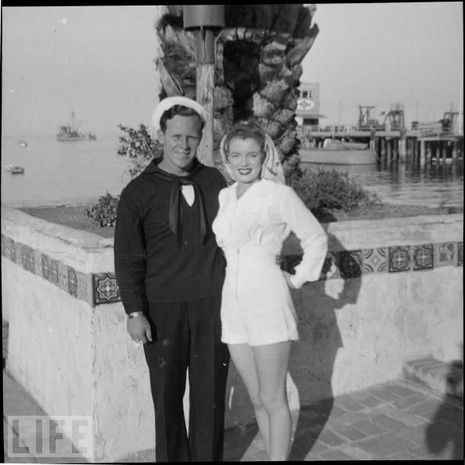 Dougherty implies that if he had not left Norma Jeane alone, circumstances would have been different for them. He talks of Norma Jeane Dougherty and Marilyn Monroe as though they were two different people -- as if in his absence persons and forces beyond his control changed his naive, uncomplicated Norma Jeane into an ambitious, calculating career woman. Dougherty wrote her several letters telling her that once he returned from service, she would have to give up her modeling. A dissatisfied Norma Jeane, who now saw the possibilities of a modeling and acting career, decided then to divorce Dougherty. The marriage ended when he returned from overseas in 1946.